Wilhelm Koller (1829-1884/85) was born in Vienna where he studied at the Academy. He subsequently went to Düsseldorf and made several trip to Antwerp. He steeled in Brussels in 1859 and moved to paris ten years later. He died near Nancy. This painting is a fine example of Wilhelm Koller's oeuvre essentially drawing upon the history of 6th-century Germany. Although it is difficult to identify the precise event related here, the costumes suggest a scene set in the 15th century. 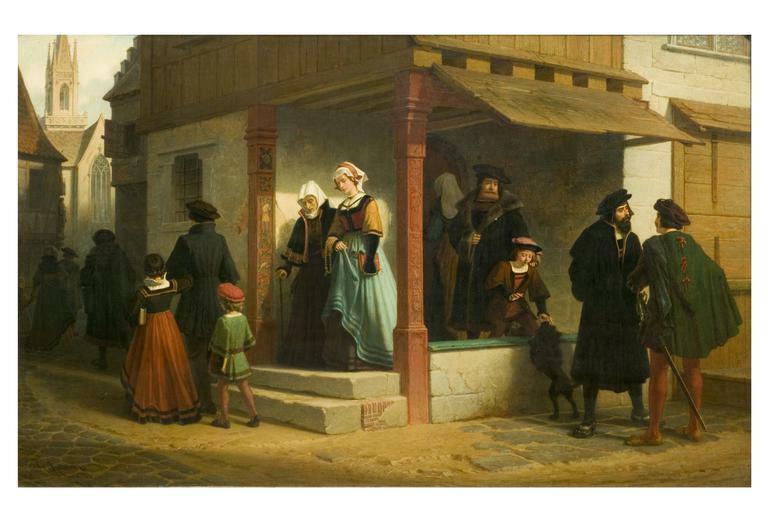 It is a fine example of the Düsseldorf school, which combines the Nazarene and Parisian history painting with a taste for Neo-Renaissance imagery. In a village, two women in 15th-century costumes are leaving a house with a missal and a rosary; while a group of people are heading towards a church in the background; behind the two women are a man standing and a young boy playing with a dog, far left two men conversing. Historical significance: This type of pictures can be described as a late revival of the Troubadour spirit emerged in the early 19th century. In Germany in general and the Düsseldorf school in particular, this revival constituted a middle road between the early Nazarene and the Romantic French history painting. The work of the Romantic artist Karl Friedrich Lessing (1808-1880) is particularly significant in this regard. 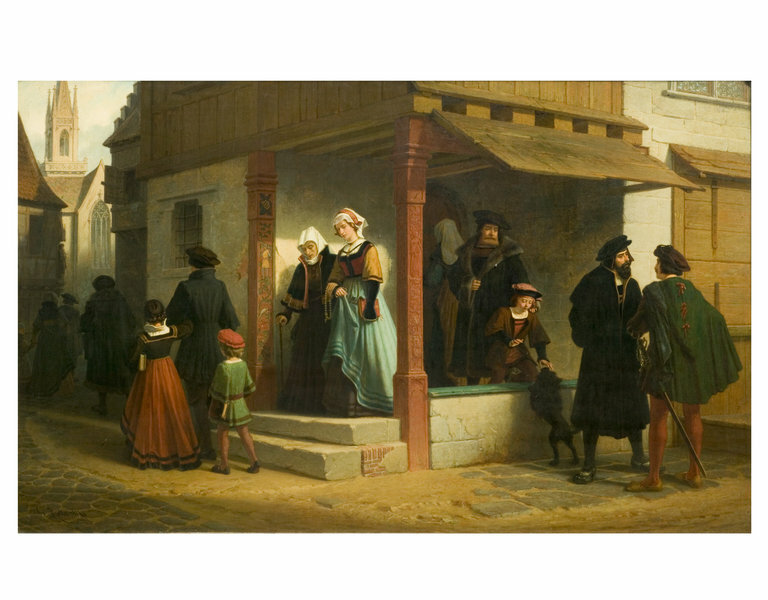 Similar compositions included a panel attributed to Gustave Koller but most likely by Wilhelm Koller, sold at Sotheby's Monaco, 21 Jun 1986, lot 299, and another entitled Farewell, dated 1864, in the Kunsthalle, Hamburg (Inv. 3029). The work of Wilhelm Koller is quite rare in the UK. Kauffmann, C.M. Catalogue of Foreign Paintings, II. 1800-1900 , London: Victoria and Albert Museum, 1973, p. 57, cat. no. 124.